Obama speechwriter voting for McCain. It's not just Joe the Plumber and his question - it's the mocking of 'just Joe' Americans by the elitist campaign that is dashing party unity. Centrist Democrats - are you thinking about the gulf of difference between Obama and Hillary Clinton? Realizing that Obama stands to the left of the Democratic party? Your party has moved. Time to move on. UPDATE: Will Bower, PUMA spokesman is on On the Record with Greta Van Susteren. There has been some dispute between the campaigns about promises to take public financing and changing course and about past participation in creating the public financing mechanism in the first place. But it seems that perhaps there's something more that could be done. Given that Obama's campaign has raised some $600 million dollars and McCain's campaign can only utilize some $84 million, it seems that, just to avoid appearing as a capitalistic juggernaut, the veritable oil company of the presidential campaign, the Obama campaign should be forced to take one third of its proceeds and give them to the McCain campaign. This isn't to penalize the Obama campaign for their success, it's just the patriotic thing to do, just a matter of simple fairness. You know, spread the wealth, so to speak. Gallup Pollster: I see dead people. Question: What do wabbits do when they get tired of wunning awound? Are Americans investing their time reading pro 'Blue' books or pro 'Red' books? Amazon exposes it's sales data. Pretty interesting to notice the recent trend and the comparison to 2004. Of course, it's difficult to determine if this is a measure of voter sentiment or a measure of literacy. I don’t see what any informed American could find to motivate them to vote for him. 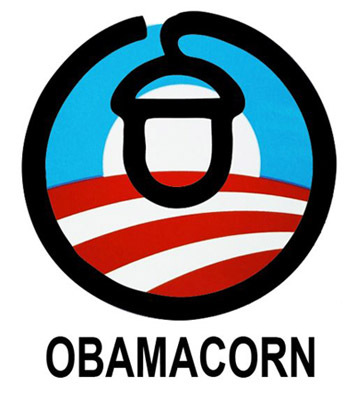 Dear Mrs. Malkin has all the gory obamacorn details. It is worth reading every word and every link. Especially this. Recently we noted another Obama connection that's been boiling in the conservative blogs for about a year. Well, it's just on page four, and by conservative journalist Mark Hyman, but it appears that there's some notice from the mainstream media - the Washington Times - on Barack Obama's intervention in the elections in Kenya while on a brief respite from his presidential campaign a few months ago. Hyman's succinct telling demonstrates what is at best shockingly poor judgment on Obama's part, and at worst is his possible collaboration with Islamist terrorists and a bloodthirsty grab for power. In reference to any other personage on the planet, this story would be four inch high letters on every production of the Fourth Estate in the nation. For now, we have to settle with the fourth page somewhere.